The city of Washington, D.C.'s pension fund quietly sold off its fossil fuel stocks over the last couple years. The District of Columbia Retirement Board (DCRB) made the announcement earlier this month. Though the holdings only amounted to one-third of one percent of the fund's assets, activists cheered. "We've seen common sense action [on climate change] get blocked year after year after year in Congress," said Kurt Walters with the activist group DC Divest. "This is the way we can really go on offense and fight back." The group's three-year campaign to get DCRB to divest is part of a global movement pressuring universities, governments, foundations and other institutional investors to give up their coal, oil and natural gas holdings. More than 500 institutions worth more than $3.4 trillion have taken some kind of action toward divesting, according to the environmental group 350.org. But while activists tend to make the case on moral grounds, the business case for getting out of fossil fuels is getting increasing attention. Last December in Paris, nations committed to keeping the planet from warming more than 2 degrees Celsius above pre-industrial levels. That means drastic reductions in greenhouse gas emissions. The credit ratings agency Moody's Investors Service says the Paris agreement makes it more and more likely that governments will take action to limit the use of fossil fuels. And the exponential growth of renewable energy technology also threatens to disrupt energy markets. 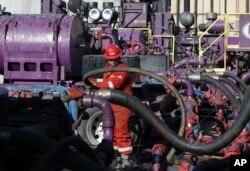 FILE - A worker adjusts hoses during a hydraulic fracturing operation at an Encana Corp. oil well near Mead, Colorado, March 25, 2014 photo. Those forces and others may soon "become a significant ratings driver in a broad set of industries," Brian Cahill, a Moody's managing director, said in a statement. Coal is already taking a hit, Moody's notes, and the agency expects other industries to be affected within three to five years. Reports by CitiGroup, the Economist Intelligence Unit, and the investment consulting firm Mercer are delivering that same message: Fossil fuel's days are numbered. But the industry is pushing back. When DCRB announced its divestment, the American Petroleum Institute said it was failing in its duty to its retirees. In a statement, the group pointed to a report showing that oil and gas stocks have outperformed other assets in state pension funds. "Divestment from energy stocks is likely to reduce investment returns and is therefore not in agreement with their fiduciary responsibility," said API Vice President of Regulatory and Economic Policy Kyle Isakower. Although the D.C. Retirement Board sold its fossil fuel stocks, Independent Petroleum Association of America spokesman Matt Dempsey notes that "they have significant amounts of money in mutual funds," which include energy assets, "and they're not divesting from that." "The purpose of the divestment campaign is not about the bottom line of fossil fuel companies," he added. "It's a way to demonize the industry." But demonizing the industry can have a greater impact on companies than dumping their shares, notes Ben Caldecott, head of the sustainable finance program at the University of Oxford Smith School of Enterprise and the Environment. 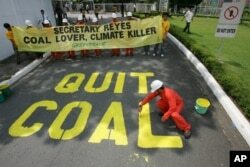 FILE - Activists from the environmentalist group Greenpeace paint the words "Quit Coal" on the driveway of the Department of Energy at Manila's Taguig city, June 3, 2008. Caldecott co-authored a 2013 report that said the stigmatizing effect of the divestment campaign could scare away customers, potential employees, policymakers and others. Top oil companies have faced increasingly vocal shareholders demanding action on climate change. And executives are feeling the pressure in their private lives. "It's not that much fun going to dinner parties and having to say that you work in a stigmatized industry," Caldecott said. More and more financial institutions are coming to him with questions about climate risks, he says. "I think the divestment campaign has helped push that up the agenda, the same way that Paris has helped push it up the agenda," he added.